More Palestinian civilians have died as a result of the conflict with Israel in 2014 than in any year since 1967, according to a UN report which called for restraint on both sides. Thereport, published by the United Nations Office for the Coordination of Humanitarian Affairs (OCHA) Thursday, notes that due to summer 2014 hostilities in the Gaza Strip known as Operation Protective Edge more than 2,220 Palestinians, including 1,492 civilians lost their lives. A total of 513 children were among the dead, the report notes. In what the report called the “worst escalation of hostilities” since the Six-Day War in 1967, 71 Israelis were also killed, 66 of whom were soldiers. The OCHA urged both sides to follow international law during future spikes in hostilities to minimize or avoid civilian casualties. “All parties to the conflict... must fulfill their legal obligations to conduct hostilities in accordance with international law to ensure the protection of all civilians and to ensure accountability for acts committed,” it said. In addition, the report notes that Gaza witnessed a huge spike in internal displacement, with 500,000 people displaced at the height of last summer’s hostilities. 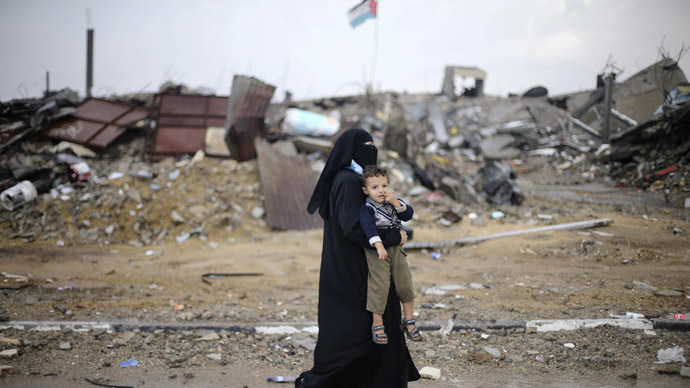 Some 100,000 people remain displaced throughout Gaza. Violence and fatalities in the West Bank including East Jerusalem also surged this year. According to the report, Palestinian fatalities involving Israeli security forces were at their highest since 2007. In total, the West Bank witnessed 58 Palestinian fatalities in 2014, compared to 28 the previous year. Meanwhile an Amnesty International report also published Thursday lambasted Palestinian armed groups for their “flagrant disregard” for the lives of Israeli civilians, specifically calling out of the violence of Hamas, who are in control of the Gaza Strip. The report says, however, that the fact that they "appear to have carried out war crimes by firing indiscriminate rockets and mortars does not absolve the Israeli forces from their obligations." Israel took control of the West Bank and the Gaza Strip in the 1967 war, and proceeded to build settlements in the captured territory, which have been deemed an illegal occupation by the international community.